Frontier Fireworks started trading back in 1996 with the help from the Princes Youth Business Trust. A business model was put in place for what we wanted to achieve and where we wanted to take Frontier Fireworks. Over 20 years later we have reached a number of our targets but our enthusiasm and hard working ethics have not changed, we are still looking to provide bigger, more spectacular displays every year. Both company Directors had a different background before starting the company which helped us create a fresh approach in an industry that some people looked upon as “tired” and in need of fresh blood. In essence we were the new company on the block and were quite young as people when we entered the fireworks industry. We entered the National Fireworks Championships in 2000 when we only had four years experience behind us and were placed third which was an achievement in itself, as we were rated higher than well established companies in the competition. We returned once again in 2002 and were awarded the runners up position in the same competition, again beating more established companies than ourselves. Our business model changed slightly after the competitions as we realised that our customer care and main business of providing displays and working with a diverse client base was more important to us than taking part in competitions. This has stood the test of time as we have increased our client base year on year. When we look back over the past few years we really have worked with some amazing clients including the British Olympic Association in 2012, the RAF Red Arrows 50th Anniversary in 2014, the opening of the British Airways i360 in 2016, and the Heritage Flame Lighting Ceremony for the Rio Paralympics 2016 amongst many others. We have fired from every surface imaginable, from land and out to sea and from fields to structures and tops of churches, cathedrals and many other buildings. We have continued to research fireworks displays from around the world to ensure that we are right on the cusp of technology and fireworks development to ensure that we are one of the best display companies in the UK. Our clients are testament to what we have achieved in the past and how enthusiastically we are looking to the future. As a founder of the company, Chris originally came into the fireworks industry from a sports background. After much research into what other companies provided, Chris had a clear vision of where he wanted to take Frontier Fireworks. Chris has always had a competitive edge to everything he has done and looks for the best in everything he and the company achieves. He is often the driving force with regards to energy and enthusiasm, working in all types of environments and motivating everyone around him. Quite often in the fireworks industry, staff members break away from existing fireworks companies and start their own fireworks business but Chris came into the industry for the love of fireworks. He has installed a friendly, honest, competitive feel to the company and has upheld British values within the company pushing for British industry to show what we have to offer. Chris is the Artistic Director of the company because of his natural ability to inject creativity and artistry into the displays that are designed for clients. You will most likely find that you will talk to Chris with regards to display choreography too as his love of music and fireworks choreography blend so well with creative themes. Client care is very high on the company’s agenda and Chris will endeavour to ensure that all of the company’s clients are looked after with an excellent care package. 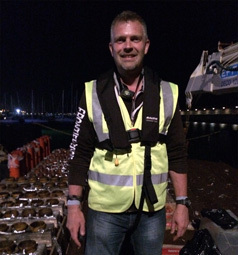 Special projects that involve displays with high profile clients or national events are our forte and Chris has been the point of contact for these events often working long hours to ensure that every event is a resounding success. Having the enthusiasm to take Frontier Fireworks into the future, developing new skills and creative ideas, the company is in sound hands for what the future holds. As a co-founder of the company Helen Stenlake has a vast amount of knowledge regarding the fireworks industry. Helen prides herself on her high level of attention to detail and her methodical approach to problems. Helen will use these skills to assess display venues in terms of access and suitability for the practical aspects of a display. Helen also has a great ability to listen to clients and to understand what they require for their events. Much of Helen’s work is behind the scenes as she is in charge of the logistics surrounding displays, ensuring that our crews have all the right information, equipment and fireworks for each display. This ranges from organising crew placements, travel details and accommodation to preparing equipment packing lists and detailed site rigging plans as well as checking all firing plans are finalised and ready to go. This is no mean feat during the Guy Fawkes season when we have numerous displays, many of which are back to back and spread around the country. Helen is very involved with the designing of fireworks displays. Her practical approach is a great complement to the artistic requirements of performances, allowing all possibilities to be considered in the planning of a display. Helen is also a keen photographer and has been developing this skill to photograph our many displays whenever she gets the chance and isn’t actually firing the displays herself. In fact many of the photographs on this website have been taken by Helen over the years. 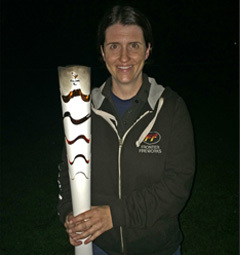 A recent highlight for Helen was performing the display for the Heritage Flame Lighting Ceremony for the Rio Paralympics. During this event Helen was given the honour of carrying the torch for part of the procession and actually lighting the first firework with the Paralympics torch - a rare opportunity indeed.